Q. When is state spending considered ‘wasteful’ by the TPA? A. When it was instituted by a British Labour government. This is the impression one can’t fail to get when reading the following two statements by the Taxpayer’s Alliance on the subject of government-developed iPhone applications, which improve civic engagement. April 30th, 2010, posted on Taxpayer’s Alliance website. In the Dutch city of Eindhoven, citizens can now report broken street lights, potholes, graffiti etc. using an app on their iphones. Users can take a picture and locate the problem on GPS and maps and send it directly to the local authority so they can easily locate and solve the problem. Obviously not everyone has an iphone, but it’s a great innovation that involves citizens in looking after their community. July 6th, 2010, statement given to media by Mark Wallace, TPA campaign director, after news leaks via FOI requests that the previous government spent £40,000 on something similar. “It seems many Government bodies have given in to the temptation to spend money on fashionable gimmicks at a time when they are meant to be cutting back on self-indulgent wastes of money…It is ridiculous not only that they are commissioning these apps but that some of them are supposedly secret on grounds of national security. 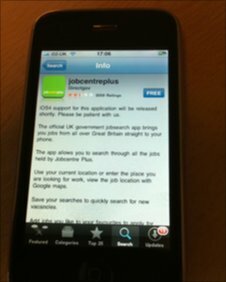 The recent furore is over the government developing iPhone apps to provide DVLA services, to provide Jobcentre services and so on. Personally I think it’s a great idea – I don’t have an iPhone, but I do have a smartphone, and applications have a way of transferring across, once developed. Because even those who have been prudent with their savings and worked hard to amass them can be made unemployed, and even bottom of the chain workers can fit this particular bill? Nice to know what the BBC generally thinks of the unemployed though; if they have anything remotely fancy, there’s something funny going on.